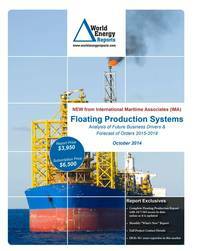 WER’s 2018 Forecast Report, the 21st in a series of forecasts dating from 1998, presents our projection of floating production system orders over the next five years. The 102 page report provides market intelligence and insights useful to business planners and others involved in deepwater development. First we present our assessment of the underlying deepwater market conditions likely to prevail over the 2018/22 time frame. Then we provide our forecast of orders for FPSOs, FPUs, FLNGs, FSRUs and FSOs under three market scenarios. The forecast for 2018/22 is much higher than last year – with the number of production floater orders and projected capex up more than 30 percent from our 2017/21 forecast. Driving the higher numbers are the improving underlying market conditions, an expected strong revival of FPSO orders (especially in Brazil), heightened interest in FLNGs to monetize stranded gas and a rapidly growing number of potential FSRU projects.